Karina's Kreations: Stampin'Up File Folder Gift Card Video! Stampin'Up File Folder Gift Card Video! I finally did a video for you on how to make a file folder card with the punch board envelope. Yeah!!!! I ran a gift card class last week and this design was one of the projects. I even made some instructions for you and I hope you try to make one! Watch the first part of the video to see how to punch the tabs! Birthday Cake File Folder Punch Board Gift Card Holder! 1. Score Naturals Ivory 5-1/2” x 8-1/2”card stock at 4-1/4”. 2. Place the short edge in the envelope punchboard along the left hand edge of the punch. Punch. Move the card stock to the 3” mark and punch. 3. Repeat on the opposite edge. 4. 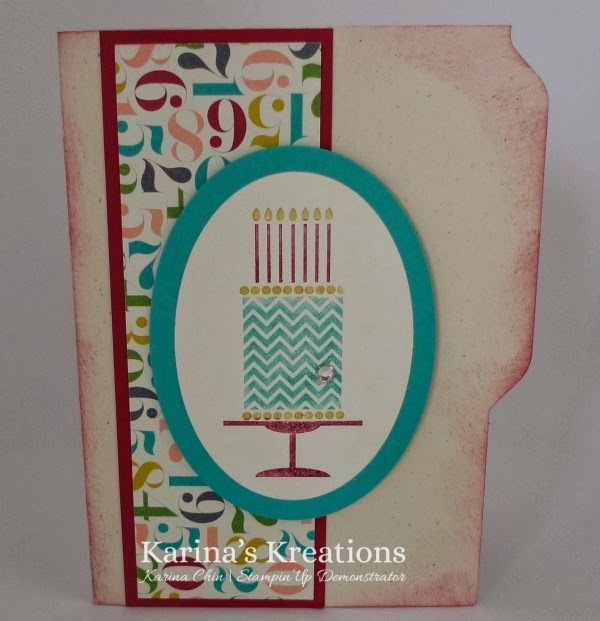 Cut off part of the card with scissors or the Stampin’ Trimmer up to the file folder tab. Repeat on the other side. 5. 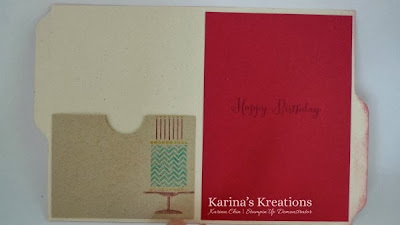 Attach 1-3/4” x 5-1/4” Designer Paper to the Raspberry Ripple 2” x 5-1/2” card stock. Attach to the card. 6. Cut Very Vanilla 2-1/2” x 3-1/4” cardstock and Bermuda Bay 2-3/4” x 3-3/4” card stock with the oval framelits. 7. Color the Birthday cake image with Stampin’ Write markers and stamp on the Very Vanilla card stock. Make sure you HUFF(breath on it) it before stamping. Attach to the Bermuda Bay Oval. Attach to card with Stampin’Dimensionals. 8. Close your notecard envelope and cut it in half. Use ½ the envelope as your gift card holder. Punch ½ a circle with the 1” circle Punch. Attach to the inside of your card with sticky strip. 9. Stamp Happy Birthday with Basic Gray ink on 3-3/4” x5-1/4” Raspberry Ripple card stock. Attach to the inside of the card.